376 Marlborough is located on the south side of Marlborough, between Hereford and Massachusetts Avenue, with 374 Marlborough to the east and 378 Marlborough to the west. 376 Marlborough was designed by architect Carl Fehmer and built in 1880-1881 by Benjamin F. Dewing, mason, as the home of Miss Anne Dana Sever and Miss Emily Sever, sisters. They are shown as the owners on the original building permit application, dated May 13, 1880. Anne and Emily Sever purchased the land for 376 Marlborough on May 10, 1880, from Benjamin Williams Crowninshield and Walter Channing Cabot. It was part of a parcel with a 498 foot frontage on Marlborough, extending west to Massachusetts Avenue, that they had acquired on January 20, 1880, from John Brooks Fenno and William Storer Eaton. J. Brooks Fenno and William Eaton had purchased the land that same day from Grenville T. W. Braman, Henry D. Hyde, and Henry M. Whitney, trustees of a real estate investment trust that had purchased several parcels of land on March 1, 1872, from the Boston Water Power Company. 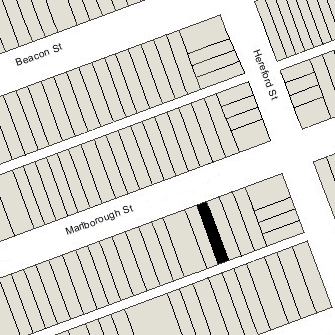 Click here for an index to the deeds for 376 Marlborough, and click here for further information on the land on the south side of Marlborough between Hereford and Massachusetts Avenue. By the 1882-1883 winter season, Anne and Emily Sever had made 376 Marlborough their home. They previously had lived at 94 Chestnut Street (where their sister, Mary Sever, a Sister of Charity, lived with them at the time of the 1880 US Census). They were living elsewhere during the 1885-1886 and 1886-1887 winter seasons. During the 1885-1886 winter season, 376 Marlborough was the home of Mrs. N. K. Bishop, probably Nancy King (Dabney) Bishop, the widow of William Winsor Bishop. She had lived at 7 Exeter in 1875. Her usual residence was in Providence, where her husband had been a cotton manufacturer and bleachery operator before his death in January of 1865, killed with two of their daughters in the sinking of the SS Melville. During the 1886-1887 winter season, it was the home of General William Stowell Tilton and his wife, Elizabeth (Loring) Tilton. He.had served in the Civil War, receiving the rank of brevet brigadier general in 1865, and subsequently served as governor of the National Home for Disabled Volunteer Soldiers in Togus, Maine, from 1869 until his retirement in 1883. He also was a noted horse breeder. Anne Sever had resumed living at 376 Marlborough by the 1887-1888 winter season, and Emily Sever had resumed living with her by the 1889-1890 season. Anne Sever died in March of 1896. Emily Sever continued to live at 376 Marlborough. By the 1918-1919 winter season, Emily Sever had been joined at 376 Marlborough by her nurse, Miss Madeline Georgina Revell. Emily Sever and Madeline Revell continued to live at 376 Marlborough during the 1923-1924 winter season. By the early 1920s, and possibly before, Emily Sever also maintained a home in Newport. She was living there in 1924 and 376 Marlborough was temporarily the home of Susan (Jackson) Williams, the widow of real estate trustee Ralph Blake Williams. She had lived at 459 Beacon in 1923. She moved from 376 Marlborough by 1925 and by 1926 was living at 431 Beacon. Emily Sever and Madeline Revell lived at at 376 Marlborough during the 1924-1925 winter season. Emily Sever died in July of 1925 in Newport. 376 Marlborough was not listed in the 1926 Blue Book. During the 1926-1927 winter season, 376 Marlborough was the home of Warwick Greene, a bachelor. He previously had lived at 80 Pinckney. He was president of the New England Oil Refining Company and formerly had been director of public works in the Philippines (until 1916) and then director of the War Relief Commission of the Rockefeller Foundation. By 1927, he had moved to 30 Allston. After Emily Sever’s death, 376 Marlborough was owned by her estate and by Robert Sever Hale and Richard Walden Hale, the sons of Anna and Emily Sever’s sister, Ellen (Sever) Tebbets Hale, the widow of Rev. Theodore Tebbets and of George Silsbee Hale. Anna Sever probably either left her interest in 376 Marlborough to Robert and Richard Hale or to Ellen Hale and it was inherited by them upon her death in May of 1904. On October 31, 1927, 376 Marlborough was purchased from Emily Sever’s estate and Robert and Richard Hale by Theodora Maria (Eldredge) Lawrence, the widow of real estate and insurance broker Harris Hooper Lawrence. They previously had lived at 470 Beacon. They also maintained a home, Nine-Acre Lodge, in Concord, Massachusetts, where H. Hooper Lawrence had died in September of 1927. Theodora Lawrence died in February of 1929. 376 Marlborough continued to be owned by a trust established under her will and was the home of the Lawrences’ five children: Caroline Freeman Lawrence, Barbara Lawrence, Theodora Lawrence, Frances Ann Lawrence, and Thomas Lawrence. Caroline Lawrence married April of 1930 to Frederick Shattuck Whiteside, a textile mill executive. After their marriage, they lived at 376 Marlborough with her sisters and brother. They all continued to live there during the 1932-1933 winter season, but moved thereafter. By 1935, the Whitesides were living in Cambridge. On October 5, 1934, 376 Marlborough was acquired from the trust established under Theodora Lawrence’s will by John J. Reardon. The house was not listed in the 1934-1937 Blue Books nor in the 1934-1937 Lists of Residents, and is shown as vacant in the 1934-1937 City Directories. On January 31, 1936, the Supreme Lodge New England Order of Protection foreclosed on a mortgage given by John Reardon and took possession of 376 Marlborough. On April 1, 1937, 376 Marlborough was purchased from the New England Order of Protection by Dr. Chauncey N. Lewis. He was a dentist and oral surgeon, and also maintained his dental office there. He previously had lived in Melrose and had maintained his office at 406 Marlborough. He also maintained a home in Weymouth. That same month, he applied for (and subsequently received) permission to convert the property from a single-family dwelling into a single-family dwelling and doctor’s office. In July of 1938, he applied for (and subsequently received) permission to add a penthouse, including removing the “high peak on [the] front wall” and building a “brick cornice at roof level.” The penthouse was located on the eastern half of the roof. Plans for the addition, prepared by architect Robert L. Davison, are included in the City of Boston Blueprints Collection in the Boston Public Library’s Arts Department (reference BIN R-12). In 1939, he married Annabel (Park) Fabyan, the widow of Francis Wright Fabyan. She previously had lived at 31 Gloucester and in Buzzard’s Bay, where her first husband died in September of 1937. After their marriage, the Lewises lived at 376 Marlborough and maintained a home in Buzzard’s Bay. On April 29, 1940, Chauncey Lewis transferred 376 Marlborough into his and his wife’s names. Annabel Lewis’s niece, Florence Jones, lived with them. She was the daughter of Ralph Augustus Jones and Florence (Park) Jones (she had been born in August of 1925 and her mother had died in childbirth or soon thereafter; it appears that she was raised by her aunt, Annabel Lewis, and her grandmother, Gertrude May (Hood) Park). Annabel Lewis died in February of 1946. Chauncey Lewis continued live and maintain his medical offices at 376 Marlborough until about 1947. On November 10, 1947, 376 Marlborough was purchased from Chauncey Lewis by Russell Franklin Stanley and his wife, Alva Kristina (Lindstrom) Stanley. Russell Stanley was with the state police and Alva Stanley was a nurse. They had married in June of 1946 and had lived at 121 Beacon with her parents, Bror August Lindstrom and Alida Kristina (Akerblom) Lindstrom. 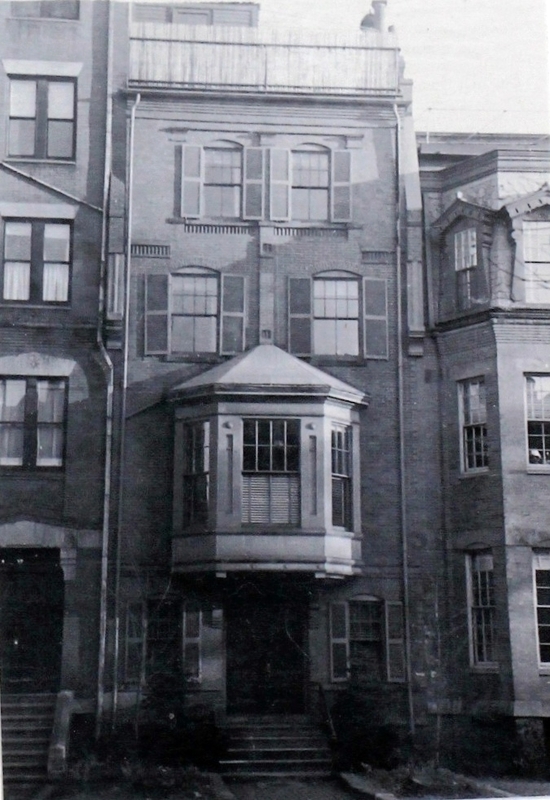 The Stanleys lived on the top floor of 376 Marlborough and operated the property as a lodging house. In March of 1954, the Stanleys applied for (and subsequently received) permission to convert the property into a two-family dwelling and lodging house. They continued to live there until about 1955. On February 16, 1956, 376 Marlborough was purchased from the Stanleys by Hazen Martin Jonah and his wife, Katherine (McCulloch) Jonah. He was assistant manager of the Boston Ice Company. They lived in Winchester. On October 24, 1956, 376 Marlborough was purchased from the Jonahs by Barnett Feldstein and his wife, Edith (Martin) Feldstein. He was treasurer of the General Textile Company; they lived in Dorchester. The Feldsteins may have operated the property as a lodging house, but by the mid-1960s it had been converted into six apartments. On January 2, 1964, 376 Marlborough was acquired from the Feldsteins by Richard W. Lubart, and on the same day it was acquired from him by Henry J. Greene, trustee, Greene Realty Trust. On December 6, 1966, the Feldsteins foreclosed on a mortgage given by Henry Greene and took back possession of the property. On March 15, 1967, 376 Marlborough was purchased from the Feldsteins by William Ingram Monaghan. He and his wife, Eleanor (Patzer) Monaghan, lived in Metairie, Louisiana. On July 25, 1979, 376 Marlborough was purchased from Gail Marcus by Kevin O’Reilly, trustee of the 376 Marlborough Street Trust. In March of 1980, Bailey O’Reilly Associates applied for (and subsequently received) permission to legalize the occupancy as six apartments, which they indicated was the existing condition. 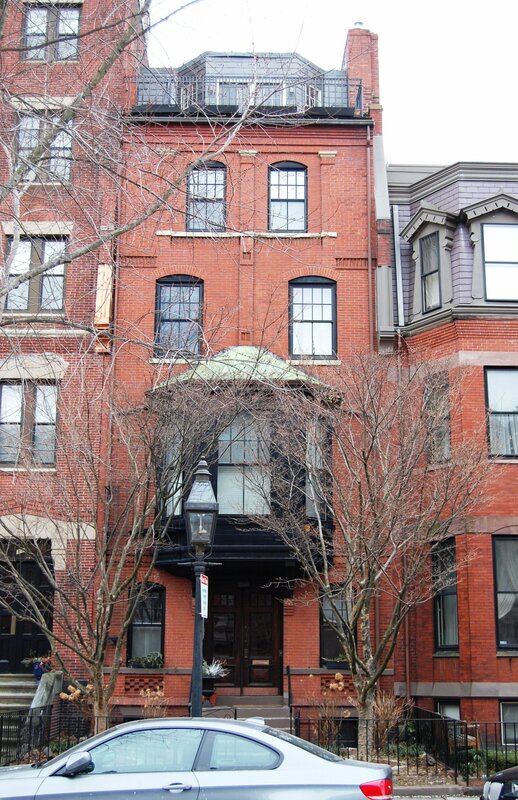 On February 26, 1980, Kevin O’Reilly converted the property into six condominium units, the 376 Marlborough Street Condominium. In March of 1987, Thomas Buckeley, the owner of the top floor condominium, applied for (and subsequently received) permission to expand the existing penthouse.